For many years the bridge has been promoted by ourselves, Sustrans and local political figures – notably Simon Hughes and Caloline Pidgeon. It now has the full backing of Sadiq Khan and Tfl and is being actively planned. 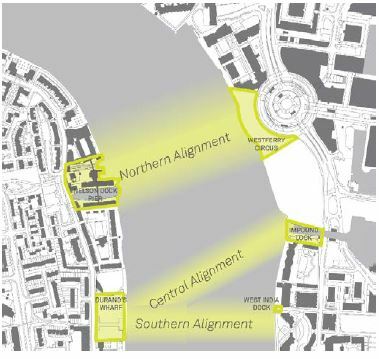 The primary challenge is the need to allow passage of river traffic, which includes large ships (large naval vessals, cruise liners etc) visiting the Pool of London (located between London Bridge and Tower Bridge. Tower bridge, completed in 1894, provides a combination solution to this challenge, with a lifting bridge at the lower level and a high level walkway. Why the Name “Brunel Bridge”? The famous father and son engineers, Marc and Isambard Kingdom Brunel are closely associated with the area, having built the first underwater tunnel (now carrying the Overground line between Rotherhithe and Wapping stations) which was completed in 1843.